Entering Aberlady from it's Western end you soon come apon the beautiful village church. Although it is very pleasing to the eye nowadays it was not always so. In fact until it was renovated around 1886 it was described as plain, unattractive, even ugly. Until this renovation the church was a different shape to what it is today - more 'square' than rectangular.The Kirk Session Notes of 2nd June 1887 record the following " The New Church, built by the Earl of Wemyss, this day opened for worship.". 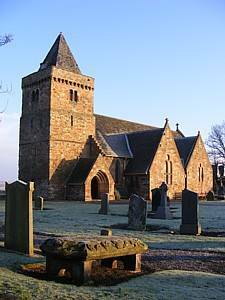 Until the middle of the 1980s Aberlady had it's own Minister who lived in the Manse next to the church. It was then that the parishes of Aberlady and Gullane ( the next village to the East of Aberlady ) were merged with one minister serving both parishes with the consequence that the Manse in Aberlady was sold off. Although our village church has served the commmunity for many years - since the 15th century? - it is thought that prior to this time a Culdee chapel may have been the place of worship. To the East of the Church, after the old manse, is the Kirk Stables where local groups and individuals can hold small events. Used by the Sunday School every week it is also the venue for a very popular plant and produce sale in May. If you would like to attend the weekly services which are held at 11:15am each Sunday, please do so as you will be made most welcome.